Though it may not seem like it today, certain parts of Vanier North and New Edinburgh were at one point a site of industrial activity and the sort of rough living that is often associated with it. Given its location at the corner of Beechwood and Charlevoix in Vanier (then Eastview), close to Betchermann Iron and Steel and the Dominion Bridge Company (to say nothing of the other nearby industrial organizations), it’s probably not a surprise that the El Ropo would attract a tougher clientele. Note: This story was first published on December 20, 2013 at Ottawa Start. This version differs in that I have added my customary citations. I’d also like to note that I would love to see a proper picture of El Ropo’s facade. If anybody has quick access to one, I’d be very interested. The future seemed bright in 1957. Source: Ottawa Journal, April 6, 1957, 24. It would be a mistake to apply this characterization on the location alone, however. After all, Ludger Dore operated his Café St-Charles at that address until his death in 1956 with seemingly little incident. At least nothing that made the papers.1 “Ludger Dore, 70, Restauranteur Dies,” Ottawa Journal, July 23, 1956, 2. When former handyman and contractor2Numerous ads were placed in the Ottawa Journal for his services, which included repairs, renovations, roofing, and snow removal between 1953 and 1957, ending just as the El Ropo was opened. See Ottawa Journal, May 12, 1953, 31; Ottawa Journal, May 29, 1957, 46. Yule hadn’t been entirely out of the news before: as a young man of 20 in 1947, he was charged with assault as the result of a battle between the Ottawa Police and striking workers at the Ottawa Car and Aircraft plant at Kent and Slater. See “Striker Charged With Assaulting Ottawa Constable,” Ottawa Journal, May 13, 1947, 1, 12; “Ottawa Striker Held For Committal,” Ottawa Journal, May 26, 1947, 12. Roger Yule took over the premises and opened his El Ropo Restaurant in 1957, it seemed like he would continue that tradition. Outside of being caught selling beer that he did not purchase in Ontario in 1958,3 “Restauranteur Fined On Beer Count,” Ottawa Journal, September 26, 1958, 45. it seemed like things would remain somewhat peaceful. In 1961, that would all change. On January 14, the Journal reported that Mrs. Lillian Schwergert, a waitress at the restaurant suffered from first-degree burns when she was scalded with hot water. How she ended up scalded, was that owner Roger Yule was in a dispute with Gary Angell (a patron of the restaurant), who was alleged to have assaulted Yule. In self-defence, Yule threw a pot of hot water at him. Before the incident came to trial, another incident with similar allegations was reported to have taken place the following week.4 “Scalding Victim Recovering In Hospital,” Ottawa Journal, January 14, 1961, 3; “Fined $20, Costs In Restaurant Disturbance,” Ottawa Journal, February 3, 1961, 38. The Journal reported on March 10 that Angell was convicted of assaulting Yule and fined $15 with $3.50 in costs (or five days) for his assault of Yule and was fined $10 and $3.50 in costs (or two days) for causing a disturbance. Magistrate O’Connor warned Yule: “Don’t throw any more boiling water. Next time call the police.”5 “Fined For Starting Fight in Restaurant,” Ottawa Journal, March 10, 1961, 26. In their own reporting on the incident, the Citizen had noted that Yule’s wife had thrown water in the past. This turned out to be untrue, however, and they printed a retraction stating that “at no time, in open court, did the magistrate make direct reference to Mrs. Yule, a civil servant who on occasion helps out in the restaurant.”6 “Hot Coffee Reference Corrected,” Ottawa Citizen, April 22, 1961, 2. Gary Angell, fined $32 for assault and causing a disturbance. Yule warned about his self-defence tactics. Source: Ottawa Journal, March 10, 1961, 26. Vanier (then Eastview) had been incorporated as a town for some time, had been growing rapidly, and was well on its way to becoming a City, which it did in 1963.7 “Janeville Grew Into Eastview,” Ottawa Journal, January 14, 1963, 47. With the town’s Zoning and Planning Board formally constituted in the spring of 1961, one of the first orders of business was to invite Roger Yule to appear before council and explain why he should be granted a license to operate his restaurant.8G. Gordon-Lennox, “Eastview Planning Board,” Ottawa Journal, May 18, 1961, 3; “Court Of Revision Named For Eastview,” Ottawa Citizen, May 18, 1961, 3. First order of business: have Yule explain why his restaurant should remain open. Source: Ottawa Journal, May 18, 1961, 3. The number of disturbances reported on the premises was high. Police were called regularly, and the neighbours found it to be something of a nuisance. 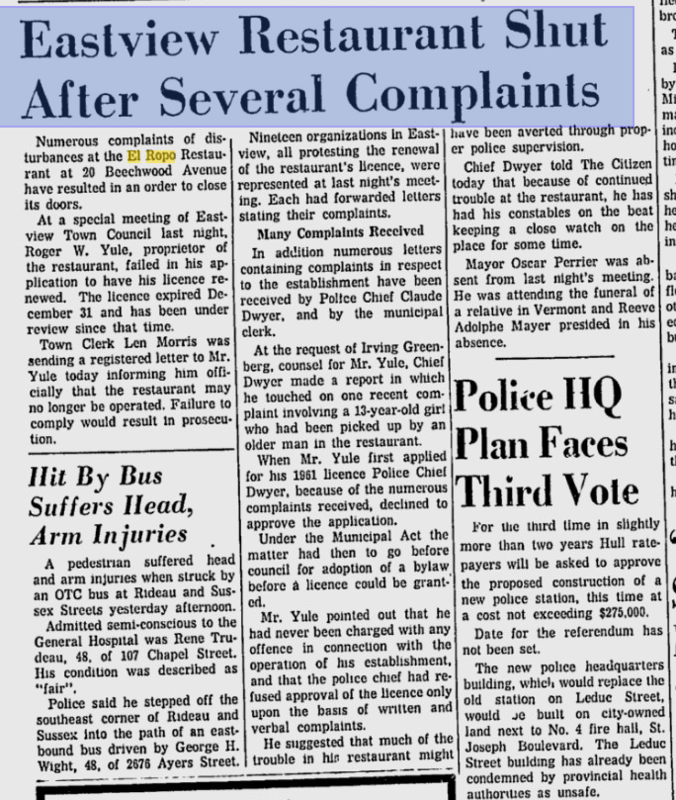 With the letters and phone calls so frequent, Eastview Police Chief Claude Dwyer recommended that the El Ropo’s license, which had expired on December 31, 1960, not be renewed. It wasn’t only Chief Dwyer, however. A number of local social, religious, and juvenile service agencies were in attendance and opposed to the restaurant. In the face of such opposition, Yule’s appearance in front of Town Council seems to have been something of a formality and his bid for a license was rejected on May 24. Of importance is that Town Council did not explicitly reject his bid for a license in their own name, but allowed the Chief’s decision to stand. This distinction would later be important.9 “Eastview Restaurant Shut After Several Complaints,” Ottawa Citizen, May 25, 1961, 7; “Leave Restaurant License to Chief,” Ottawa Journal, May 25, 1961, 42. Eastview came out in force to oppose the granting of the El Ropo’s license. Source: Ottawa Citizen, May 25, 1961, 7. Yule and his lawyer Irving Greenberg claimed that if there was any failure, it was not on his own part, but that the policing of that corner was lacking. Yule was quoted in the Journal the following morning as saying “[there] has never been anything wrong gone on in my restaurant” noting that many people who he had banned continued to return.10 “Eastview Restaurant Shut After Several Complaints,” Ottawa Citizen, May 25, 1961, 7. Unwanted pests continued to return, Yule said. His solicitor, Irving Greenberg suggested it was a failure to provide adequate policing. Source: Ottawa Journal, May 25, 1961, 42. None of this phased Yule. In fact, it only emboldened him. In spite of his being refused a license, Yule mounted a protest by erecting signs in the front window and he refused to close his business. Yule was quoted by the Journal as saying that “[this] whole affair has had a bad effect on business. Now people think they can get arrested if they enter my place.” He then suggested that “it’s up to the chief to make the first move.” In the face of such open defiance, Dwyer proceeded to Charge Yule under Eastview By-Law No. 167, operating a restaurant without a licence. 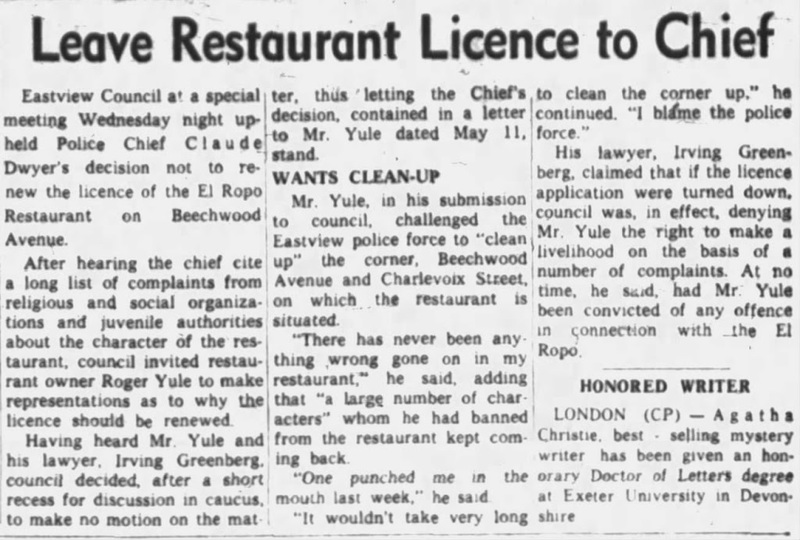 If found guilty, Yule could be charged a maximum of $300 per day he remained open.11 “Eastview’s ‘El Ropo’ Rides On,” Ottawa Citizen, May 27, 1961, 7; “Police Act Against Restaurant,” Ottawa Citizen, May 29, 1961, 7; “Consult Solicitor Over Signs,” Ottawa Journal, May 29, 1961, 1; “Charge Laid Over Closing Of Restaurant,” Ottawa Citizen, May 31, 1961, 7. Yule protests Eastview’s refusal to license his establishment. Source: Ottawa Citizen, May 27, 1961, 7. Yule was then ordered to appear before Eastview Magistrate Austin O’Connor, someone familiar with the disturbances in and around the El Ropo.12 “El Ropo Manager Charged,” Ottawa Journal, May 30, 1961, 5. Perhaps fearing an unfair trial as a result, Greenberg requested to appear before another magistrate, declining to outline specifically why he made such a request. In a challenge to Greenberg, O’Connor asked him whether it may have been him who recommended that Yule refuse to close. Greenberg declined to answer this as well. True to form, Yule ignored the numerous summonses he was issued – holding out for a new magistrate.13 “Asks New Magistrate For Case,” Ottawa Journal, June 1, 1961, 5; “Cafe Owner Has Nine Summonses,” Ottawa Journal, June 7, 1961, 16. There was some suggestion that, seemingly one that stemmed from Eastview Reeve Adolphe Mayer, that Alderman James Mannion was related to Yule. See “Eastview Council Promises Action On Mooing Cows and Speeding Autos,” Ottawa Citizen, June 8, 1961, 3. This was granted on June 8, when it was agreed to grant him a hearing in front of Deputy Magistrate Omer Chartrand.14 “Other Judge May Hear El Ropo Case,” Ottawa Journal, June 9, 1961, 22. Yule’s request for another Magistrate was granted. Source: Ottawa Journal, June 9, 1961, 22. For his own part, Yule didn’t sit still while he waited for his court date. On June 14, the Citizen reported that he drove to Toronto with his two sons and crashed an unrelated provincial government hearing in protest of the way he felt he had been treated by Chief Dwyer. Once the hearing’s chairman informed him that there was little he could do for him, Yule quietly returned to his banner-festooned car, did a couple of laps around Queen’s Park, and left.15 “El Ropo’s Owner Gets A Hearing,” Ottawa Citizen, June 14, 1961, 1. Yule took his protest to Toronto in mid-June. Source: Ottawa Citizen, June 14, 1961, 1. During Yule’s hearing on June 15, Yule’s new lawyer, Donald Diplock, alleged that Eastview’s by-law did not explicitly outline the duties of the police chief and that he was not delegated those powers explicitly. The decision was reserved until the following Monday (the 18th).16 “Decision Reserved In El Ropo Case,” Ottawa Journal, June 16, 1961, 33. While Yule was found guilty of operating without a license, his total fine was only $45 (rather than the $3000 maximum for the 10 days open without). Magistrate Chartrand concluded that while the delegation wasn’t illegal, the by-law wasn’t sufficiently clear.17 “Fine Owner Of El Ropo $45, Costs,” Ottawa Citizen, June 19, 1961, 7; “El Ropo Owner Convicted,” Ottawa Journal, June 19, 1961, 5. Yule fined $45. It was not to be his last fine. Source: Ottawa Citizen, June 19, 1961, 7. Convicted and still without a license to operate, Yule opened his restaurant as he normally would on June 19. Once again, Chief Dwyer pointed out that should Yule remain open, he’ll be charged with the same by-law infraction. Sure enough as the sun rises, Yule was again charged on June 21. He was quoted in the Journal, saying that “I’ll go to jail before I close.” Coincidentally, he had appeared as a witness that morning at the Carleton County Juvenile and Family Court in the trial of a youth who was alleged to have assaulted him in the El Ropo that May.18 “El Ropo Still Open,” Ottawa Journal, June 20, 1961, 10; “El Ropo Owner Faces New Charges,” Ottawa Journal, June 21, 1961, 8. Yule had become an increasingly familiar presence in the courts as the result of his struggle to stay open and manage his clientele. Source: Ottawa Journal, June 21, 1961, 8. While he had filed an appeal for his conviction, Yule petitioned Eastview Town Council to stop issuing summonses. He was denied.19”Eastview To Press Civil Suits,” Ottawa Journal, June 22, 1961, 3. As the El Ropo case continued to consume much more oxygen than was likely desired, town council moved to amend its restaurant by-law, primarily to clarify the chief’s role.20 “Restaurant Bylaw Revised,” Ottawa Journal, June 28, 1961, 52; “Yule Appealing Convictions,” Ottawa Journal, July 6, 1961, 5. Once again, Yule found himself on the losing end of the battle and Magistrate James Rennicks found him guilty. This time, Yule was fined $250 with costs (or 30 days) and an additional $50. He was given a suspended sentence on 17 other charges. Through the entire ordeal the signs of protest remained in the front window of the restaurant.21 “El Ropo Owner Fined Again,” Ottawa Journal, July 13, 1961, 5; “Injunction Ordered On El Ropo,” Ottawa Journal, March 20, 1962, 4. Mr. Justice Aylen issued an interim injunction against Yule, forcing him to remove his protest signs. Source: Ottawa Journal, March 20, 1962, 4. The same battle was waged once more during the spring of 1962, this time with an injunction being issued against Yule to force him to remove those signs. The Journal reported once again that Yule was charged and found guilty: this time $150 payable within the week or a 30-day jail sentence.22 “El Ropo Owner Fined – Again,” Ottawa Journal, March 29, 1962, 26. License or no license, Yule refused to back down after another round of fines. Source: Ottawa Journal, March 29, 1962, 26. The tale came to an end when the Citizen reported on June 6, 1962 that the building at the corner which housed the El Ropo had been sold and the site would soon become the site of a Canadian Oil Co. service station. Canadian Oil Companies, then purveyors of White Rose Gasoline, was bought out by Shell the following year. 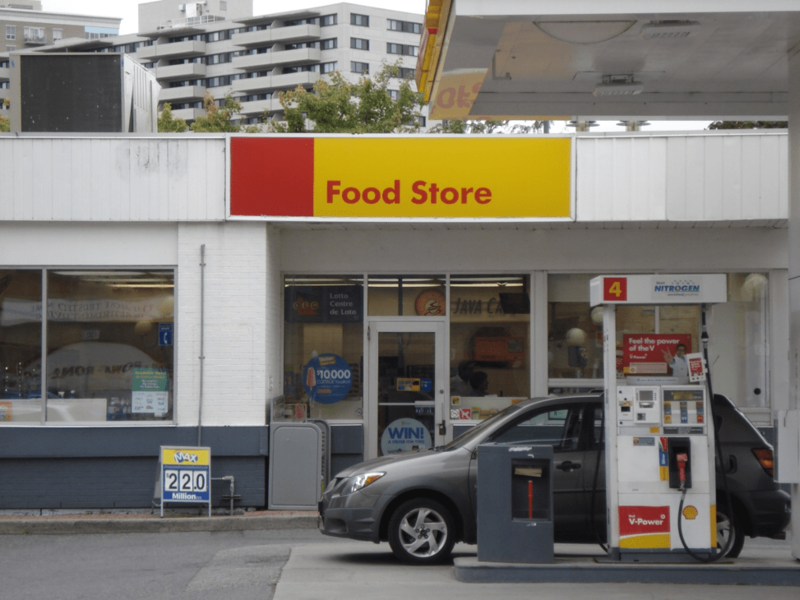 From what I understand, the station that was constructed always bore the Shell branding. Interestingly, it was a gas station that removed the fuel from this fire.23 “Metro Mix,” Ottawa Citizen, June 6, 1962. The El Ropo’s ride comes to an end. The building that housed the outlaw restaurant was sold to Canadian Oil Co. Source: Ottawa Citizen, June 6, 1962. 1. ↥ “Ludger Dore, 70, Restauranteur Dies,” Ottawa Journal, July 23, 1956, 2. 2. ↥ Numerous ads were placed in the Ottawa Journal for his services, which included repairs, renovations, roofing, and snow removal between 1953 and 1957, ending just as the El Ropo was opened. See Ottawa Journal, May 12, 1953, 31; Ottawa Journal, May 29, 1957, 46. Yule hadn’t been entirely out of the news before: as a young man of 20 in 1947, he was charged with assault as the result of a battle between the Ottawa Police and striking workers at the Ottawa Car and Aircraft plant at Kent and Slater. See “Striker Charged With Assaulting Ottawa Constable,” Ottawa Journal, May 13, 1947, 1, 12; “Ottawa Striker Held For Committal,” Ottawa Journal, May 26, 1947, 12. 3. ↥ “Restauranteur Fined On Beer Count,” Ottawa Journal, September 26, 1958, 45. 4. ↥ “Scalding Victim Recovering In Hospital,” Ottawa Journal, January 14, 1961, 3; “Fined $20, Costs In Restaurant Disturbance,” Ottawa Journal, February 3, 1961, 38. 5. 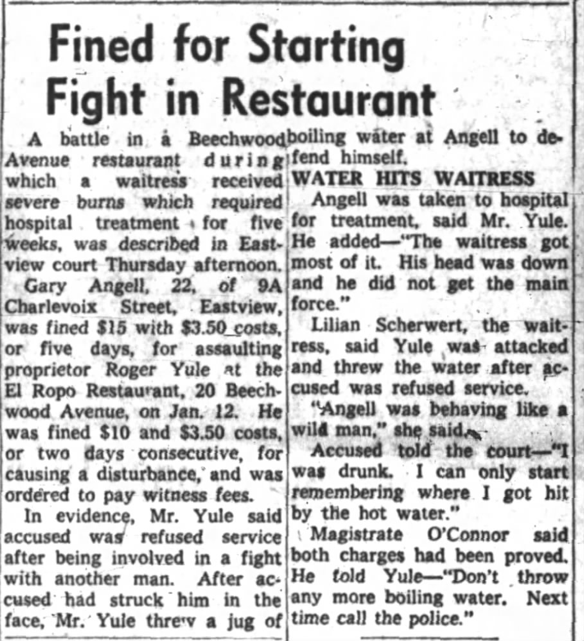 ↥ “Fined For Starting Fight in Restaurant,” Ottawa Journal, March 10, 1961, 26. 6. ↥ “Hot Coffee Reference Corrected,” Ottawa Citizen, April 22, 1961, 2. 7. ↥ “Janeville Grew Into Eastview,” Ottawa Journal, January 14, 1963, 47. 8. ↥ G. Gordon-Lennox, “Eastview Planning Board,” Ottawa Journal, May 18, 1961, 3; “Court Of Revision Named For Eastview,” Ottawa Citizen, May 18, 1961, 3. 9. ↥ “Eastview Restaurant Shut After Several Complaints,” Ottawa Citizen, May 25, 1961, 7; “Leave Restaurant License to Chief,” Ottawa Journal, May 25, 1961, 42. 10. 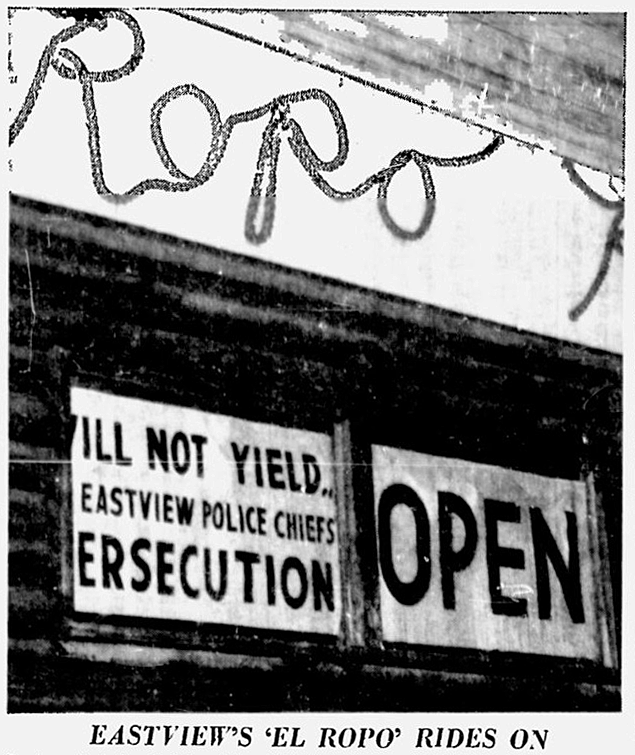 ↥ “Eastview Restaurant Shut After Several Complaints,” Ottawa Citizen, May 25, 1961, 7. 11. 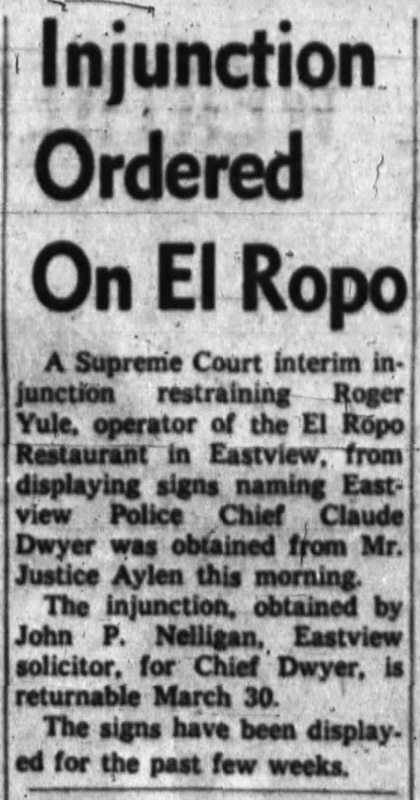 ↥ “Eastview’s ‘El Ropo’ Rides On,” Ottawa Citizen, May 27, 1961, 7; “Police Act Against Restaurant,” Ottawa Citizen, May 29, 1961, 7; “Consult Solicitor Over Signs,” Ottawa Journal, May 29, 1961, 1; “Charge Laid Over Closing Of Restaurant,” Ottawa Citizen, May 31, 1961, 7. 12. ↥ “El Ropo Manager Charged,” Ottawa Journal, May 30, 1961, 5. 13. ↥ “Asks New Magistrate For Case,” Ottawa Journal, June 1, 1961, 5; “Cafe Owner Has Nine Summonses,” Ottawa Journal, June 7, 1961, 16. There was some suggestion that, seemingly one that stemmed from Eastview Reeve Adolphe Mayer, that Alderman James Mannion was related to Yule. See “Eastview Council Promises Action On Mooing Cows and Speeding Autos,” Ottawa Citizen, June 8, 1961, 3. 14. 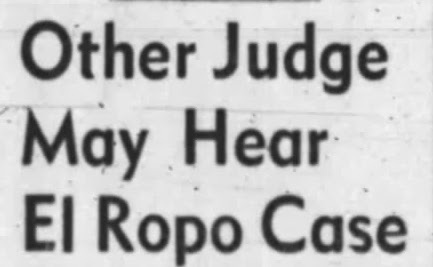 ↥ “Other Judge May Hear El Ropo Case,” Ottawa Journal, June 9, 1961, 22. 15. 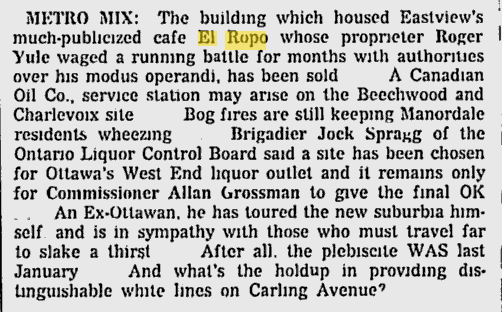 ↥ “El Ropo’s Owner Gets A Hearing,” Ottawa Citizen, June 14, 1961, 1. 16. ↥ “Decision Reserved In El Ropo Case,” Ottawa Journal, June 16, 1961, 33. 17. ↥ “Fine Owner Of El Ropo $45, Costs,” Ottawa Citizen, June 19, 1961, 7; “El Ropo Owner Convicted,” Ottawa Journal, June 19, 1961, 5. 18. ↥ “El Ropo Still Open,” Ottawa Journal, June 20, 1961, 10; “El Ropo Owner Faces New Charges,” Ottawa Journal, June 21, 1961, 8. 19. ↥ ”Eastview To Press Civil Suits,” Ottawa Journal, June 22, 1961, 3. 20. ↥ “Restaurant Bylaw Revised,” Ottawa Journal, June 28, 1961, 52; “Yule Appealing Convictions,” Ottawa Journal, July 6, 1961, 5. 21. ↥ “El Ropo Owner Fined Again,” Ottawa Journal, July 13, 1961, 5; “Injunction Ordered On El Ropo,” Ottawa Journal, March 20, 1962, 4. 22. ↥ “El Ropo Owner Fined – Again,” Ottawa Journal, March 29, 1962, 26. 23. ↥ “Metro Mix,” Ottawa Citizen, June 6, 1962.